Connect ShockLink to training pads and a standard defibrillator to begin training. The shock energy from a defibrillator is defused in the ShockLink cable. This solution means that you can train on most manikins, removing the need for specialised defibrillator training manikins with chest-studs or a load box to absorb the shock. ShockLink connects most commonly used defibrillators to the majority of current CPR manikins or simulators, providing a comprehensive solution for realistic and standardised training. During a scenario, different teams can easily train together as you can swap between different defibrillators efficiently. With ShockLink, you no longer need to purchase a specific training model for your AED or a new CPR manikin, which reduces the cost of implementing live defibrillation training. ShockLink can currently connect to a range of defibrillators. Here you can find out how to connect and if an adapter is needed. Train with realistic defibrillator training pads (not studs) with all the key learning objectives from CPR-D training. 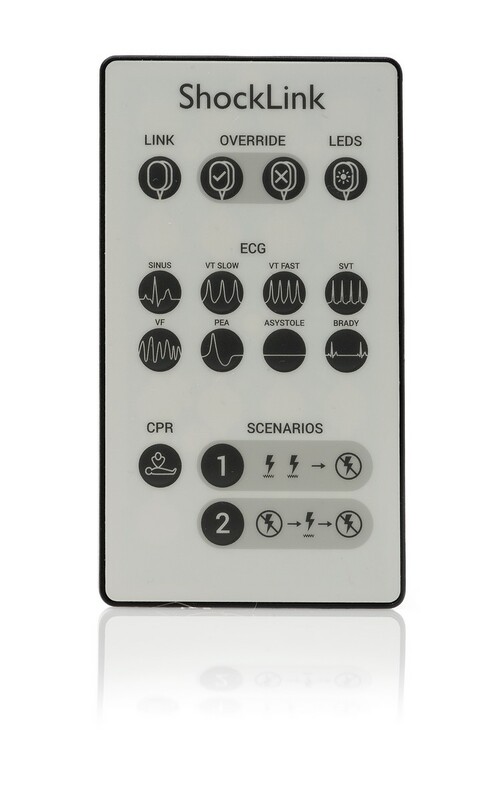 The ShockLink remote control, or a SimPad SkillReporter, can be used to prompt changes to simulated heart rhythm scenarios. Laerdal LINK Technology integrates with AED training solutions to detect pad placement and inactivity (hands off) time. Events are sent to the SimPad PLUS with SkillReporter timeline for effective real-time feedback and debriefing. Early defibrillation, within the first 5 minutes, is a key step in the Chain of Survival. With easier and more efficient training solutions more laypeople could be equipped to function as first responders in the community. Research in Sweden has shown that improved outcomes in out of hospital cardiac arrest survival rates was due to an improvement in training in all steps of the Chain of Survival (European Heart Journal, September 2014). ShockLink could help facilitate this.